There is a small white church located on a U.S. highway near the intersection of two Interstate highways in northern New Jersey. There, a Scottish flag flies over an easily missed gravestone in a small churchyard. This stone was erected by an American Founding Father over the burial plot of an officer in the British Army during the Revolution. George Washington, fearing the dissolution of his army and the end of the revolution, made a desperate attempt to turn the tides of war. On the night of December 25, 1776, his army crossed the Delaware River from Pennsylvania into New Jersey and marched to Trenton – in the dark and in a sometimes violent snowstorm. The result was an astounding surprise victory over the Hessian soldiers stationed in the small town. Though Washington quickly took his prisoners and escaped back over the Delaware to Pennsylvania, he received reports that Trenton had not been reoccupied, and so he re-crossed the river with his army and occupied the town. On 2 January 1777 General Cornwallis took the bulk of his army from Princeton and marched to meet Washington at Trenton. Those left behind at Princeton included the British 17th, 40th and 55th Regiments. After a day of skirmishing and a tense defense of the bridge over the Assunpink Creek in Trenton, Cornwallis was unable to enter the town. He ordered Colonel Charles Mawhood, commanding the forces left behind at Princeton, to bring up 800 of his men to Trenton in the morning, when he planned to resume his attack on Trenton. Washington had other plans, however, and secretly marched away at night, sending his army on a back road towards Princeton. As morning broke, General Hugh Mercer’s men and Colonel Mawhood’s detachment of the 17th and 55th (the 40th was left behind to guard Princeton) were surprised to see each other near the Stony Brook Bridge in Princeton. Nearly simultaneously, about 120 Pennsylvania and Virginia riflemen of Mercer’s force with another 200 just to their rear,and the men of the 17th – with Capt. John McPherson commanding the left, Capt. Francis Tew the center, and Captain William Leslie the right – charged for an orchard where they could have an advantage. The British fired first once they reached a fence about fifty yards from the American position. Mercer quickly returned fire and the right flank of the British suffered the most from it. Mawhood quickly ordered a bayonet charge and the Americans scattered, but not before General Mercer was knocked from his horse and mortally wounded. Gen. John Cadwalader, with one thousand Pennsylvania militiamen, quickly moved up to fill the void left by Mercer’s men, but they were also repulsed. As the British began to gain the advantage, Washington himself rode up to reorganize and encourage his men. It was then Mawhood’s turn to retreat. The Americans surrounded and captured a number of British soldiers, though others fled to New Brunswick or to meet Cornwallis on the road to Trenton in order to regroup. Knowing Cornwallis was en route, Washington quickly surveyed the field of battle with his aides. Viewing some British soldiers supporting an officer, the Americans approached to find Captain Leslie. William Leslie was born in 1751, the son of David Leslie, the sixth earl of Leven and the fifth earl of Melville in Scotland. He arrived in Britain’s North American colonies as a lieutenant in the 17th Regiment of Foot in time to witness the British and their Hessian allies attack Fort Washington in New York. He joined General Charles Cornwallis on November 27, 1776 on his march across New Jersey in pursuit of Washington’s retreating army. Leslie went into winter quarters with the rest of his regiment expecting a quiet winter. Washington’s tired army began a march to the protection of the heights of Morristown as Cornwallis neared Princeton. On their march to winter quarters, the American army halted at the small village of Pluckemin (a part of Bedminster Township today) on January 5th. 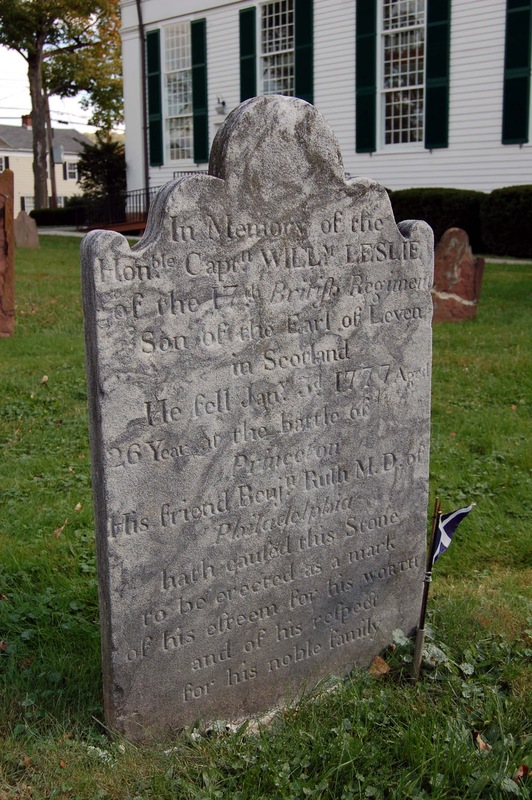 About midday, Captain Thomas Rodney of Delaware and about forty men from his regiment attended the funeral of Leslie in the churchyard of a small Lutheran church in order to bury Leslie with the honors of war, as requested by Doctor Rush. Along with Rodney and Rush, American Generals Thomas Mifflin, John Sullivan, Henry Knox, and George Washington himself attended. Washington also permitted the captured British officers to be present at the funeral. David Hackett Fischer, Washington’s Crossing, New York: Oxford University Press, 2004; page 327. Sheldon S. Cohen, “Captain William Leslie’s ‘Paths of Glory,’” New Jersey History, v. 108, no. 1-2, spring/summer 1990; page 71. See also Fischer, 330-331. All reports are from the same Cohen volume as above, p. 74. Doctor Samuel D. Grass, Lives of Eminent American Physicians and Surgeons of the Nineteenth Century, Philadelphia: Lindsay and Blakistan, 1861; p 26. Abraham Messler, Centennial History of Somerset County, Somerville, NJ: C.M. Jameson, 1878; page 78. Andrew D. Mellick, Jr., The Story of an Old Farm, Somerville, NJ: The Unionist Gazette, 1889; pages 385-6. Photo of Leslie’s grave taken by the author. A version of this piece was originally posted on the author’s blog.